ToneMatrix amazing ride still amazes me. Every day I receive a lot of comments and emails and I really appreciate the feedback. 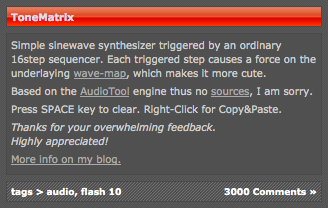 But listen: In Audiotool 1.0 (Public on Thursday!) you can also control the Pulverisateur (our new synthesizer) with the simple user-interface from the ToneMatrix. It is fun! i’m very impresed with your tonematrix. how can i get or even buy it’s sources? we would like to use it in developing our small application, where google maps and tonematrix gonna be meashedup.